Kim & Lev are Fun In The Sun Weddings’ newest Newlyweds! 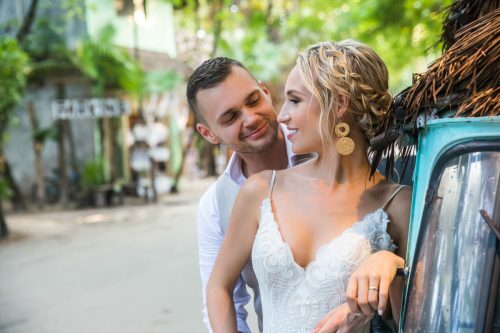 This bride and groom’s adventure has taken them around the world, and back to where it all began for their bohemian beach wedding in Tulum. Kim and Lev are from Vancouver, Canada. Their families live five minutes apart. Lev knew her cousin and even worked with Kim’s sister at one point. 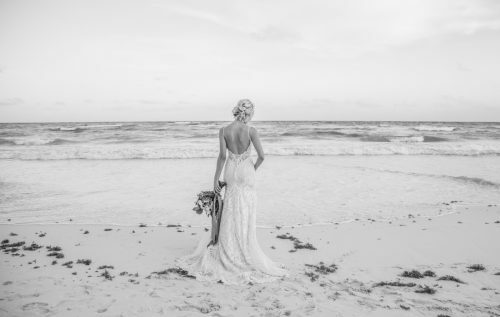 But the bride and groom somehow never met each other until they each moved to the Riviera Maya, Mexico. She and Lev had both been recruited to work for a resort group, and they met on her first day. The rest is history. Kim and Lev were on vacation in Singapore when he popped the question. They went for lunch at the Wolfgang Puck restaurant that sits in front of the world’s highest infinity pool. He handed his phone to someone to take a photo of them, whispered to take a video instead, and then sweating profusely, he got down one knee and proposed in front of the entire restaurant. She said Yes! 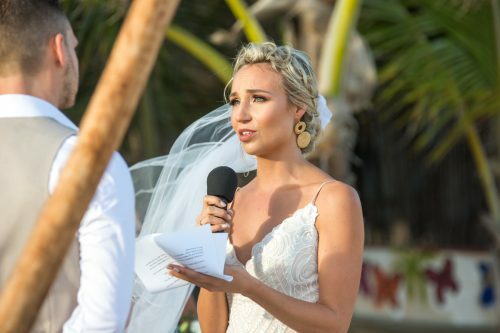 Why a destination wedding in Tulum? 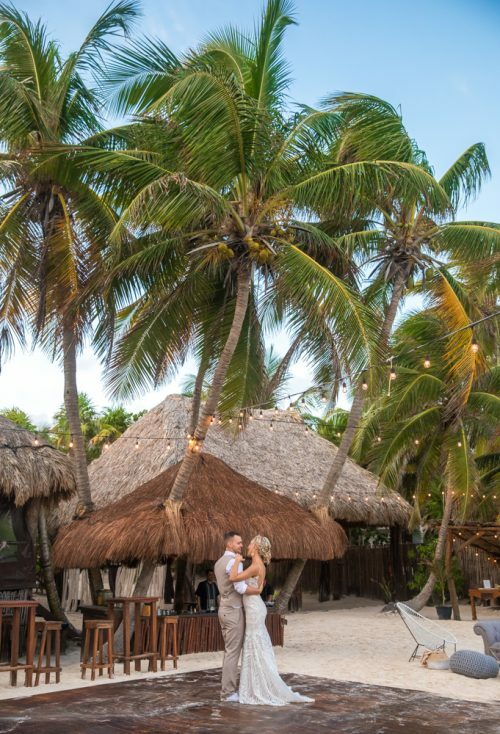 During their engagement, the couple moved back to Vancouver, and so their vision of getting married on a stunning Tulum beach became planning a destination wedding rather than a local one. 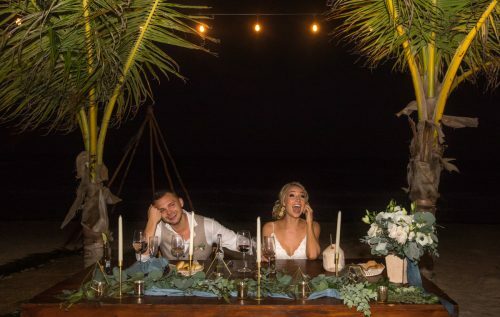 They chose one of the best wedding venues in Tulum, The Ak’iin Beach Club, for their ceremony, reception, and completely Vegan catering. 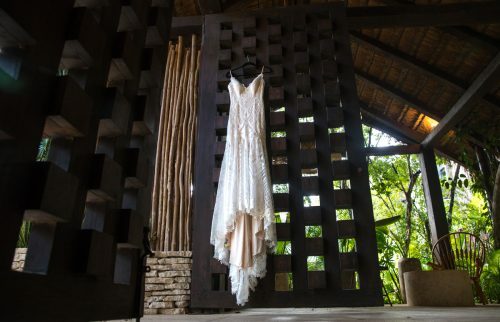 All the decor and details were inspired by Tulum’s boho-chic vibe. 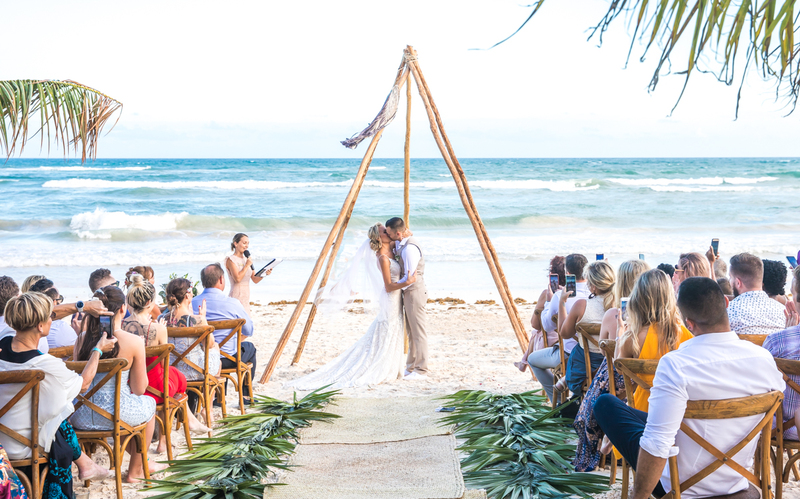 Giant macrame made by a Mayan woman in the jungle and personalized coconuts by Kocoo complimented a swanky beach lounge set up complete with Acapulco chairs by KL Design Events. The stunning floral design, bridal bouquet, and table centerpieces, as well as the welcome sign, were thanks to Sandra and her talented team at Cherry Blossom Mexico. Kim has two. The first was driving from her AirBnB to the Ak’iin Beach Club, with five girlfriends in a tiny hatchback, and one in the trunk! 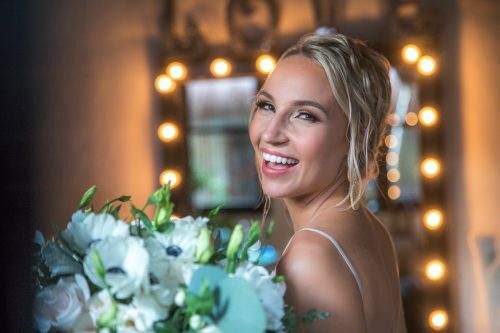 The second was walking down the aisle, glammed up by hair and makeup artist Alesia Solomko, wearing her beach wedding dress by Allure Bridals, and seeing Lev standing under the altar. She knew he had been working like crazy all day (during hours of pounding rain!) to make sure everything was perfect. When she saw Lev for the first time, she could feel his relief. What advice does Kim have for brides getting married on the beach? Hire a wedding planner! A venue’s “wedding coordinator” is not the same as a planner. Literally every detail we had to find ourselves. A planner can negotiate better prices, knows who is best, and they really just take off so much stress on your shoulders. Kim and Lev, it has been so special sharing the wedding adventure of a couple who are not only clients, but more importantly, friends we could dance with at the end of night, rocking out to DJ Diego! Thank you for trusting us with your wedding memories, and we wish you every happiness in your new life together in Vancouver. We miss you! Congratulations. 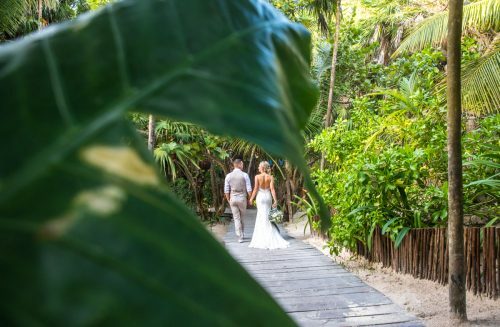 So, are YOU getting married in Tulum and want the best Tulum wedding photographer for your beach wedding? Then contact us now! 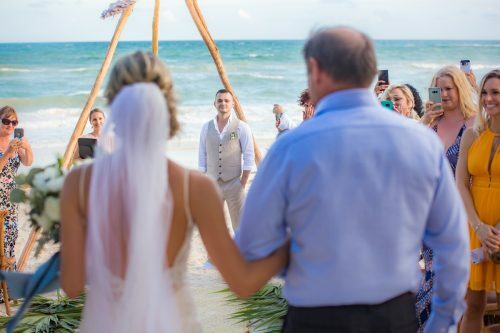 We are Fun In The Sun Weddings, for the best Tulum wedding photography. 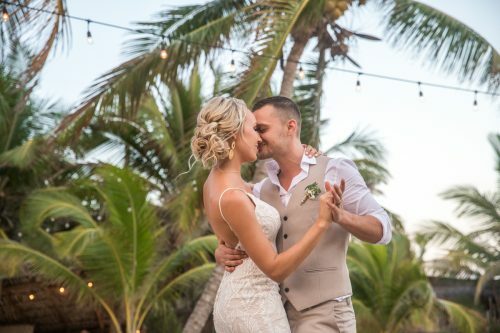 Want to know more about why you should consider an Ak’iin Beach Club wedding in Tulum? Read unbiased reviews on Tripadvisor here.